Pastor Steven Anderson shows injuries he suffered when he was beaten and tasered by Border Patrol in Arizona, after he had left San Diego. “Wake up, America! Why is this happening in America? !” Pastor asks. Editor: I just now (4:00pm Friday ) spoke to Pastor Anderson’s wife. She informed me that Steven was charged with two misdemeanors: blocking a public highway and failure to obey a lawful order. She believes his arraignment was postponed. His arraignment is scheduled for Wellton, Arizona, about 200 miles from Tempe, where they live. Her husband was stopped about 70 miles east of Yuma – in Arizona. “This has really taken a toll on the children,” Mrs. Anderson told me, as I could hear children crying in the background. Steven was on another phone at the time. Pastor Steven Anderson of Tempe, Ariz., says he was Tasered, assaulted and denied medical treatment after he refused to submit to a search by Border Patrol officers at an immigration checkpoint east of San Diego. The ACLU has called the area a “Constitution-free zone” where such abuse has become commonplace. The pastor of a Baptist church in the Phoenix area says he was stopped at an internal Border Patrol checkpoint, Tasered and beaten. Steven L. Anderson, of the Faithful Word Baptist Church in Tempe, Arizona, was returning from San Diego on Interstate 8 when he was stopped at a Border Patrol checkpoint — a common but controversial feature of what the ACLU calls the “Constitution-free zone” within 100 miles of the U.S. border, where law-enforcement authorities conduct suspicion-less searches in defiance of traditional protections for individual rights. Anderson says that, after he stood on his constitutional rights and declined to answer questions at the checkpoint, Border Patrol agents brought over a dog and claimed the animal had sniffed out either drugs or a human body in his trunk. Anderson refused to permit a search, at which time DPS (highway patrol) officers were summoned. The officers broke out his car windows and the pastor was Tasered and beaten before being arrested. 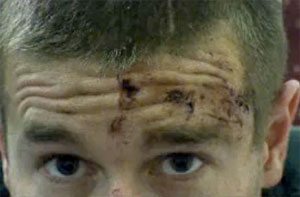 Injuries are plainly visible on Anderson’s face in a video he made after the incident. Anderson identifies three of the Border Patrol agents as C. Diaz, B. Griffiths and E. Gomez. He is due in court today, where he plans to plead “not guilty” to all charges. For more info and link to video of Pastor Anderson, go here. Tip of o’ hat to the local blog politickybitch for turning us on to this story. There may be more to this story, the Pastor is a known crack pot. Check out his website. Be warned, some of the stuff on his site may offend. Thanks a bunch Abby. Yeah, I know. I did check out his website and listened for a few moments to one of his recorded sermons. Two things: he is out there, as he called George W. Bush “a flaming liberal, and a whimp”, but in delivering god’s views on immigration, the first thing Pastor Anderson said is “number one, god is for immigration,” and then quoted a verse from Proverbs. Nevertheless, unless he is totally posturing a fraud here (for publicity for his church?) it doesn’t matter who he was if the Border Patrol roughed him up as he described in the video. His recounting of what happened seemed very genuine. The Border Patrol agents didn’t know who he was, they just did their thing. Now, in his video, he said he refused to submit to the Border Patrol search as he was standing on his 4th Amendment rights to be free from unreasonable seizures and searches. And that is when they came down on him. I could be wrong here, but I thought those dogs were trained to sniff out either one thing or the other, but not both. Abby, Ad Hominem attacks don’t cut it. Why not address the validity of his claims rather than attacking the person? What he has documented on his website (inasmuch as is related to the border patrol checkpoints) is simply a U.S. Citizen exercising his Constitutional protections against illegal search and seizure. It doesn’t matter if the guy is more near Fred Phelps than Joel Osteen? The guys constitutional rights as a U.S. Citizen were trampled underfoot by what amounts to no more than secret police performing warrantless searches on innocent U.S. Citizens in the name of “safety”. This is so much like pre-WW2 Germany it is frightening and many in the U.S. don’t even care. Question – did the dog find anything? That’s a pretty big part of the story, even if it doesn’t directly relate to whether the BoPo was acting reasonably or not (nor does whether this guy’s a complete whack job have a whole lot to do with the professionalism on display). I heard about a guy that got stopped and harassed extensively at one of these things in the middle of the desert in the middle of the day in the middle of the summer over a few grams of cannabis one time. He was traveling with family and after he’d given up the stash they tore his truck apart, opening every bottle in his mom’s makeup kit and asking her whether they were drugs, parading the people around in the sun on display for other passers-by. They called the local sheriff department to try to get them to come out and make an arrest, but the sheriff declined, too much of a waste of time to send a deputy out to write a possession ticket. Eventually these fine citizens were released, and if our hero’s dad hadn’t admitted a few miles down the road to pinching off his son’s stash and pocketing it, meaning not all was lost, it would’ve been a very unpleasant trip to Arizona indeed. PSD – no, according to Pastor Anderson in his video, the dog did not find anything except tools. Do check out the video to view this guy’s seemingly genuine recounting of his tale of woe. He says he was not resisting. So far, all we have is his video, but he is a pastor – even if he is a friggin’ homophobe and rightwing extremist politically – so I’d say give him the benefit of your doubt for the moment. The border patrol said that the dog “alerted” and this gives probable cause to search (this is correct). But Anderson said that he did not see the dog alert on anything. This means that there was no probable cause to search: by the legal standard of mere suspicion, perhaps, but by the standard of probable cause, no. Anderson asked the border patrol to bring the dog back out so they could show him alerting on the car. They refused. When DPS (the state police) arrived, Anderson asked the DPS officer to have the dog come out. The border patrol refused. The DPS officer then asked the border patrol (according to Anderson’s recounting) to bring the dog out to show him (the police officer) the alerting. Once again, the border patrol refused. Then the DPS decided to arrest Anderson for refusing to comply with a lawful order (whether that order was truly lawful or not remains for a court to decide) and for obstructing a public highway (which is a grey area; Anderson wanted to leave but was being prevented from doing so). This all sounds like a matter of he-said-she-said, but it’s really not: there were cameras all over that checkpoint, so everything that happened has been documented on video. Once the video(s) are released, we can all see for real whether or not that dog alerted (and if so, whether probable cause to search existed). And, as Frank said, the search of Anderson’s vehicle and person turned up nothing illegal. Whether or not the dog alerted, nothing was present for the dog to alert on. So if indeed the dog “alerted” on the vehicle, that calls into question the frequency of false positives. More to the point, how easy it is for an officer to use suggestion to get a dog to alert when it otherwise would not? But aside from his whacked out psychotic beliefs, I do hope this brings more attention to the racial profiling goings-on at the border checks on Americas highways. “Constitution-free zone” LOVE IT! I want to be able to read the actual story not just a “first hand” one from a pastor, who overdoes the whole defendind his rights bit. Anyone with a brain realizes that nowadays searches are commen, would he act the same at the airport. He needs to learn he isnt God just a one in a billion “servant” for him. Also, NO ONE IS ABOVE THE LAW. Apart from the Arizona Border Patrol, apparently. One thing that bothers me about events like this, is that they bring into question the effectiveness of sniffer dogs. how many more “false positives” will it take before a federal judge decides that dogs are no longer a reliable tool to gauge probable cause since these obviously inaccurate animals keep hitting on false positives. DPS/Border Patrol have done no one any good by doing this, talk about shooting yourself in the foot. they risk loosing a massively important tool in the fight against human/drug trafficking, just to, what beat someone down, this is why we’re losing the war. besides i’m sure if it had been all the pastors fault we would have seen the dashboard video from the DPS cruisers and the border patrol by now. how much do you want to bet that all of a sudden the heat nuked the video. ok– if there is ONE GUY in this country I would not defend it would be this nutjob. He is on YouTube calling Obama to be aborted and threatens all kinds of evil twisted junk. He is in some sort of fundamentalist church. Sounds to me like a nut, looking for some cash! I found this in INA 235 and INA 287. A check point is seperated into Primary and Secondary. ALL vehicles (occupants) are inspected for inmigration/ nationality. Since all are questioned, zero suspicion is required. If Reasonable Suspecion is developed (i.e. failure to answer questions, possession, drug paraphernalia, etc) the vehicle is referred to a Secondary Inspection. If the occupant(s) refuse to cooperate/ answer a questions, they may be held until immigration/ nationality (or RS)is resolved. The occupants may be ordered out of the car and questioned. All this must occur in a reasonable amount of time. If a K9 did alert, then that alert provides Probable Cause to search the vehicle under the Readily Mobile Conveyence doctrine. The K9’s and the handler’s training log will certainly be subpoenaed in court. They Dogs are trained to detect (hidden) human scent and drug residue (even a few buds). The residue from a few puffs is enough for the dogs. Follow this link of you beloved Pastor. He makes me sick. This wasn’t a border crossing, it was at a checkpoint along a highway outside Yuma which does not cross the US/Mexican border. The Border Patrol is allowed to have checkpoints within 100 miles of the border, but must have probable cause that the vehicle or its occupants had crossed the border in order to justify that type of warrantless search. Sad how so many make excuses for authority and bleme the victim. Presumably once you realise that some of those wearing authority’s uniform are themselves criminals, then you no longer have a firm place to stand. The police are not your friend; the government is your enemy. Never believe anything until it has been officially denied. At first I sympathized with this guy – but he’s all over the net just provoking cops . . . lock him up and throw away the key. The sword of the wicked shall always pierce his heart. Obviously they didn’t hit him hard enough! Just a quick note: “pastor” isn’t a pastor in any name other than what he calls himself. Just as he calls himself “straight”, he also says “pastor”. Both are illegitimate claims. There’s no sympathy for someone who hates others and then whines and cries when he gets 10% of what he dishes out for others. He’s also under criminal investigation for shady business deals – and he’s got the secret service all over him after his death threats against Obama. I hope he goes after the secret service…that would be fun to watch. Best outcome: he crawls under a rock and stops spreading hatred and vile. Not best but still good: he dies from a heart attack or some other “jesus-based” punishment. Im a little torn on this story, I am appalled at the behavior of the police, but on the other hand they should be given medals because this could not have happened to a more deserving person. Newer Article: San Francisco Labor Council Condemns SEIU’s Raid On Other Union Unite-Here.